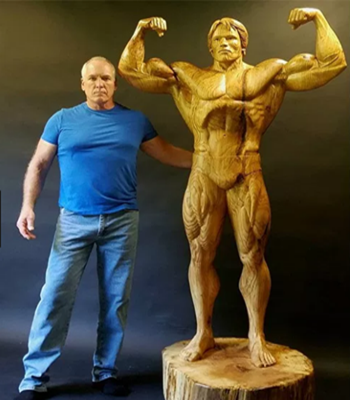 It's the Tree-minator -- a life-size statue of ArnoldSchwarzenegger carved out of a stump. The 6-foot, 2-inch likeness took artist James O'Nealsix months to fashion from a black oak trunk. Arnie was nicknamed The Austrian Oak as abodybuilder. He is also known for being an Austrian-American actor, filmmaker, businessman, investor, author, philanthropist, activist, politician and for serving two terms as the governor ofCalifornia from 2003 to 2011. O'Neal, of New Jersey, said: "This piece is why I carve trees. It's got crazy grain, so muchcharacter." O'Neal says a polyurethane coat brings out rich tones and the wood's beautiful natural grain. He is about to enter the sculpture in a local contest. His entry in named "Champions." Hopefully, it won't get termite-ated.